In review of the past year, University of Waterloo President Feridun Hamdullahpur released the 2016 Environmental Sustainability Report on Oct. 26. This year, the 52-page document highlighted eight key facets of campus which impact the surrounding environment: energy and water consumption, CO2 emissions, waste diversion, staff transportation, grounds management, fairtrade food, and purchasing. Of these, consumption of energy, output of CO2 emissions, and water usage are measured in terms of units per square meter of campus; gigajoules (GJ), kilograms, and meters cubed respectively. On-campus energy intensity, the report found, is down 3.7 per cent from 2015 for over 1 million GJ consumed over the course of 2016. This decrease is attributed largely to the mild winter, which the report states, “required less heating of campus buildings.” Accounting for this, on-campus energy usage rose slightly in comparison to earlier years. Campus contributions to climate change were measured in terms of CO2 emissions which, despite “substantial” growth of the university overall, decreased by 4.8 per cent in absolute terms in comparison to 2015. Water consumption clocked in 2.7 per cent higher in absolute terms than in the year previous, for a total water usage of more than 560 million litres in 2016. In this matter, the report noted a peculiar trend in which water consumption began a gradual increase in 2015, and emphasized the need for “increased water efficiency” moving forward. 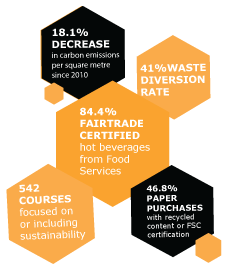 Of its strong suits, the university observed a 41 per cent waste diversion rate, integrated pest management of grounds (with the exception of privately managed sites), and an overall increase in on-campus purchases of fairtrade hot beverages from Food Services. Through its transparency, the report not only celebrated the ongoing efforts of staff and students, but offered tips for community members to reduce their own contribution to the above fields via reduced meat consumption, conservative water usage, and on-campus involvement. The university is also looking to improve its efforts. In coming months, administration will release its first environmental sustainability strategy, which will outline action to be taken to address the ongoing conflict between on-campus growth and sustainability.